KENNEDY SPACE CENTER, Fla. (NASA PR) — NASA’s Commercial Crew Program and SpaceX are finalizing plans for launch day operations as they prepare for the company’s first flight test with astronauts on board. The teams are working toward a crew test flight to the International Space Station, known as Demo-2, with NASA astronauts Bob Behnken and Doug Hurley in April 2019. 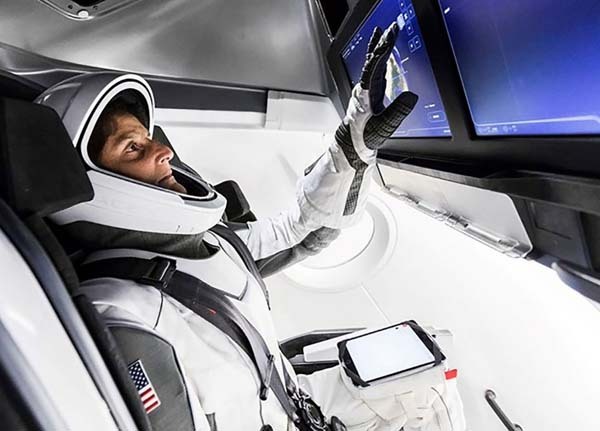 A key question the program and the company have been assessing is whether the astronauts will climb aboard the Crew Dragon spacecraft before or after SpaceX fuels the Falcon 9 rocket. NASA has made the decision to move forward with SpaceX’s plan to fuel the rocket after the astronauts are in place. While the agreement makes this plan the baseline for operations, it is contingent upon NASA’s final certification of the operation. If all goes according to plan, on launch day, the Falcon 9 composite overwrap pressure vessels, known as COPVs, will be loaded with helium and verified to be in a stable configuration prior to astronaut arrival at the launch pad. The astronauts then will board the spacecraft about two hours before launch, when the launch system is in a quiescent state. After the ground crews depart the launch pad, the launch escape systems will be activated approximately 38 minutes before liftoff, just before fueling begins. SpaceX launch controllers then will begin loading rocket grade kerosene and densified liquid oxygen approximately 35 minutes before launch. The countdown and launch preparations can be stopped automatically up to the last moment before launch. In the unlikely event of an emergency at any point up to and after launch, the launch escape systems will allow the astronauts to evacuate safely. This timeline is consistent with the fueling procedures SpaceX uses for its commercial resupply missions and satellite launches. The crew launches of NASA’s Commercial Crew partners SpaceX and Boeing will return the nation’s ability to launch our astronauts from the United States to and from the International Space Station on American spacecraft. since those COPVS will be in a warm, empty LOX tank. Loaded with ambient temperature He? Then they will presumably be loaded the rest of the way (70% or so by mass) at constant pressure as the COPVs are cooled during LOX load. My bet is on the latter, with the purpose being to fully expand the COPVs’ liners prior to LOX load to avoid the AMOS-6 scenario where frozen oxygen is believed to have been trapped between a COPV’s liner and its overwrap. I agree it will be the latter option. If they load chilled helium it will quickly warm to ambient temps without the LOX present. Yes, pre-stretching the liner makes a lot of sense. Also, helpful to verify any leaks in the He system (both in the plumbing and the liner) ahead of crew arrival.